We’ve released a new Kitomba 1 access option – Targets. Now you can give your team the ability to view and track their individual targets while keeping any other client and business information safe. You can have peace of mind while using targets to motivate and focus your team to achieve your goals and grow your salon, spa or clinic. Plus it’s even easier to go paperless! Gone are the days of printing reports and spreadsheets, instead your team just need to come to meetings equipped with their smartphones. Before you can choose an access option for your staff members, they need to become a Kitomba 1 user. Simply visit your Kitomba 1 Settings and create new users via the Staff & users tab. To learn more about creating new Kitomba 1 users, visit our support guide. Targets: Staff can only view their own targets. Standard: Limited + make and change appointments, manage products and services, create email marketing campaigns and edit Online Booking settings. Advanced: Standard + run reports, view and set targets, see client contact details, and add and edit timetable overrides. 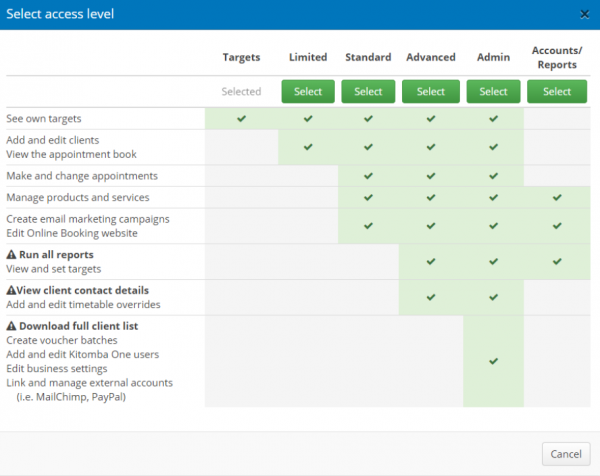 Admin: Advanced + download client lists, create voucher batches, add and edit Kitomba 1 users, edit business settings and manage accounts like MailChimp and PayPal. Accounts / Reports: Manage products and services, create email email marketing campaigns, edit Online Booking settings, run reports and view and set targets. To learn more about setting the right Kitomba 1 access for your team, check out our support guide. K1 also then needs to be able to restrict login per device – either using 2 factor such as Google login, or using cookies or IP address. A simple solution would be emailing the owner a 6 digit code or a confirmation link if the login is from a different IP address, along with the IP details of the login attempt (IP address, location, device type, OS, Browser).